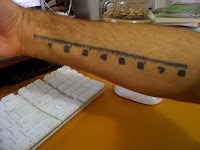 MrJerkface.com - The uncivilized illustrator: The most useful tattoo? After last weeks harrowing lobster debacle, (yes there was tears, and it was delicious, I will post pictures next week) I've harnessed my grief, and attempted to move on by focusing my attention elsewhere. This week I've been searching for the most useful tattoo. There seems to be alot of ruler tattoos out there, and a lot of science tattoos, but there's not alot of tattoos that do anything. I put plenty of thought into it, and here's what I've got so far. otes, and a rudimentary RGB/CMYK color wheel. It can't be any theorems, or reference materials, say like Fahrenheit to Celsius conversions. With reference materials, it's only handy for a month or two, then you've memorized it, and it's taking up valuable meat space. Measurement devices are useful, but the detail is restricted by width of the tattoo needle, and the tendency of the tattoo to distort and diffuse over time. Please help! I want to hear from builders, tattoo artist, graphic designers, fry cooks, anyone that has anything to say, I want to hear it! Here's an Ethernet cable wiring diagram, as requested. I put them in octagons so they can extend off of the one inch marks, and won't look out of place if more are added later. The yellow contrasts poorly with the white background, but I expect it would be highly visible on skin. I will add a diagram incorporating modular elements after I get a few more suggestions. - tattoo goes on non dominant forearm. I am right handed and should have had the tattoo put on my left forearm. That way I can hold tools in my dominant hand and measure with the left. 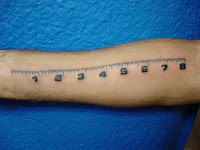 - consider a additional index finger tattoo in metric and English units. These are good for small measurements in places you cannot get your forearm into. - two circles for tea spoon / table spoon measurements on non dominant palm. - during tattooing do not flex your wrist. My ruler goes too close to my wrist and I fidgeted around from the pain. This makes my first inch off unless I recreate the extreme flex my wrist had during the tattoo process. I like your pipe sizing idea. Looks useful. My ink and numbers look good still. I use sun screen on it. I will mail you a photo tomorrow. As promised, he mailed over a current pic for me. On the bottom you can see the freshly done tattoo, and on the top, two years later. It looks to me as if the ink spread enough to make the 1/16th marks nearly indecipherable. I expect making the different increments with different color inks would keep it more legible after the ink begins to spread, but I'm gonna run that by some body mod forums, and see what they have to say. type A and type B ethernet wiring patterns. Should have been orange not yellow. Get it right Jerkface! -like the theorems, you'll eventually learn the color wheel, so that could get useless after about month. - since colors tend to fade, it might be better to have a black & white circle separated into 12 segments, with each segment a different color name. The circle of fifths is a pretty basic reference and conversion chart. It's probably useful to always have one with you, but you will eventually learn it if you look at it all the time. Plus you can just print it and keep it with your instrument(s). Though, I guess it's not a bad idea for a tattoo, since it's at least better than most music tattoos. I've been working on a univeral annelmatic sundial sleeve that I can use to tell time with the sun anywhere in the world.